Way back in 1925, when the BBC was still in its infancy, the sounds of Westhoughton's internationally-renowned Wingates Band were first heard on transmissions by our national broadcaster. 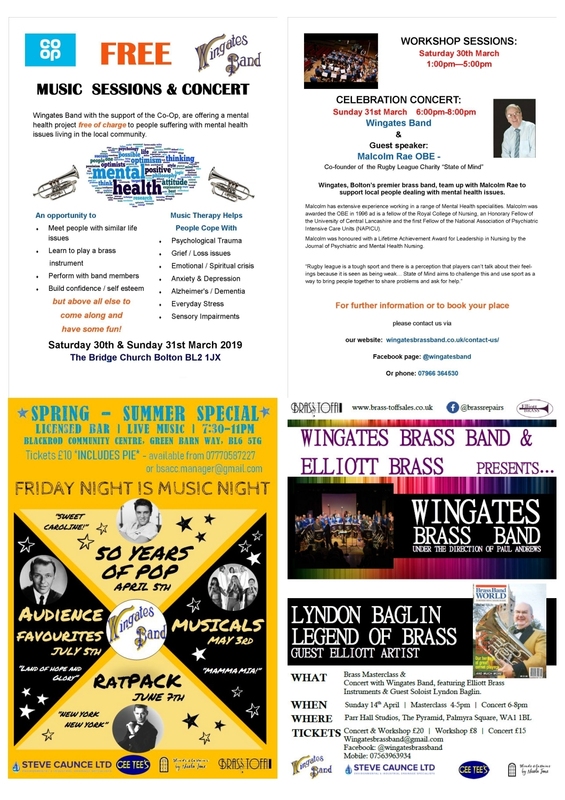 In the intervening 90 years, Wingates has featured on innumerable BBC radio programmes – and with a few TV appearances as well – with its music regularly heard by national and international listening audiences. This remarkable aspect of the Wingates story continues, with tracks from the band's latest CD album featuring in next week's edition of the popular and long-running programme, Listen to the Band. Broadcast on BBC Radio 2 on Thursday, 26th November (11:30pm, and available subsequently on iPlayer Radio), presenter Frank Renton will highlight the fact that Wingates Band is currently celebrating another magnificent milestone in its history, namely 100 years of recording its music, a landmark previously reached by only three brass bands in the world. The featured tracks are from the band's new CD album, Sounds of a Century, which, together with a fully-illustrated colour brochure telling the full story Wingates recording history, has been launched to commemorate 100 years of Wingates on shellac, vinyl, cassette tape and compact disc, since the very first recordings were made in 1915, during the early months of World War I. The two companion souvenir items will be on sale at all the band's forthcoming Christmas season performances, the highlight of which will be the ever-popular Christmas Folk and Brass concert, performed jointly with the band's great friends and Westhoughton neighbours, The Houghton Weavers, at Bolton's Victoria Hall on Saturday, 12th December, commencing at 7:30pm. Tickets for this concert can be purchased from the new box office facility at the Victoria Hall ( Telephone: 01204 522569 – limited opening hours) or from 01204 696984 / 07970 131460. Press Release, 20th November 2015.